Oakland, CA – Thirty-six leaders representing innovative community and economic development solutions in 29 U.S. and Canadian cities have been selected to the Business Alliance for Local Living Economy’s (BALLE) fourth cohort of Local Economy Fellows. These are leaders with fierce love for their communities – a love that they’re each putting to work in ways that bring equity, opportunity, capital, and support to small local businesses and the diverse populations in every community they serve. 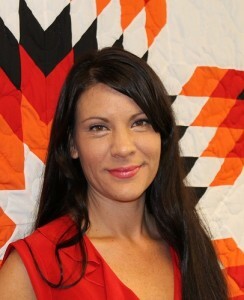 Locally, Chrystel Cornelius, Executive Director of First Nations Oweesta Corporation in Longmont, Colorado, was named to the fellowship. Chrystel is empowering Native American communities, using a CDFI model to build wealth and economic independence among tribal communities across the U.S. The BALLE Local Economy Fellowship is the only program of its kind in North America focused on advancing local economies. This immersive, 18-month program equips local economy innovators with leadership and capacity-building skills, a peer network of leaders and funders across North America, and a national platform illuminating their models for other communities. By building this network and offering a curriculum of transformative personal and professional development, BALLE aims to catalyze the emergence of an equitable new economy. BALLE Local Economy Fellows are selected based on their vision, leadership, and their roles as strategic connectors of thousands of local businesses. Given what we know about the power of small businesses in North America – they are proven to increase local civic engagement, create 60-90 percent of net new jobs in the U.S. and Canada, and represent about half of U.S. and Canadian GDP (about $9.5 trillion) – it is no exaggeration to say that BALLE Fellows and leaders like them are transforming the bedrock of our economy. The 2016 cohort directly serves more than 52,400 local businesses. Four fellows working through regional governments or focused on leveraging public dollars and policy – a new focus area of the BALLE Fellowship program – impact an additional 471,200 businesses through their work. Other focus areas of this cohort include leaders who are advancing entrepreneurship and opportunity in under-resourced communities and communities of color, advancing cooperative development and worker ownership, transitioning post-coal Appalachia, and bringing conversations about well-being, equity, and health to board rooms, funding models, and networks of small businesses. “BALLE Local Economy Fellows aren’t waiting for big government or big business to step in and fix all that ails a dying system – instead they are working to change economies right where they are, starting with the tools and resources they have: human capital, resourcefulness, and an entrepreneurial spirit,” said Shawn Escoffery, Director of the Strong Local Economies Program for the Surdna Foundation. The BALLE Local Economy Fellowship is made possible in partnership with the Christiano Family Fund, Kalliopeia Foundation, Kendeda Fund, NoVo Foundation, One 4 All (a donor advised fund of Proteus Fund), Surdna Foundation, Swift Family Foundation, two anonymous donors, and many generous individual supporters. LONGMONT, Colorado (April 29, 2016) – In honor of April being National Financial Literacy Month, First Nations Development Institute (First Nations) and First Nations Oweesta Corporation (Oweesta) have jointly released the 5th edition of the Building Native Communities: Financial Skills for Families curriculum. The revised curriculum includes an updated Participant Workbook and Instructor Guide, as well as a new website at www.BNCweb.org, a comprehensive online portal for Native financial educators and practitioners. First Nations partnered with Oweesta to convene an advisory committee to revise the Building Native Communities Participant Workbook. Funded by the Rose Foundation and the AMB Foundation, the workbook has new content that incorporates feedback from the advisory group and addresses changing technology. There are new sections that cover topics like online banking, consumer savvy (recognizing persuasion tactics), and constructing a record-keeping system. The revision team also removed outdated material and greatly enhanced the math content of the workbook. New “Money Math” activities throughout the workbook help students apply what they have learned. In addition, the revised workbook includes new illustrations, photos, infographics and charts. The resulting workbook has a more modern and visual feel. Oweesta and First Nations also updated the Instructor Guide that accompanies the Building Native Communities curriculum. New chapters address training techniques, learning styles for various demographics, financial education program design, and best practices for financial education classes. 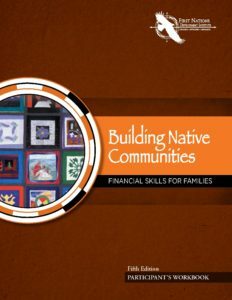 Building Native Communities: Financial Skills for Families is a culturally-appropriate guide to financial education in Native American communities that helps individuals make informed financial decisions for themselves, their families and their communities. Since the release of the first edition of the curriculum in 2000,Building Native Communities: Financial Skills for Families has become the leading financial education curriculum in Indian Country. To date, First Nations and Oweesta have distributed more than 18,000 copies of the Financial Skills for Families workbook, and over 1,400 leaders from 28 states have become certified trainers through nearly 60 Oweesta/First Nations Train-the-Trainer events. Additionally, First Nations and Oweesta launched the new financial education web portal BNCweb.org. BNCweb.org serves as a resource center for Native fina ncial education practitioners and educators. The site contains our suite of financial education curricula, downloadable instructor guides, trainer tools, research and publications, and additional materials. The website also contains links to the My Green campaign, the investnativeonline.org website, and videos and materials that can assist financial educators. All resources will be in a centralized location and will address topics such as Minor’s Trust Accounts (training resources, research, etc. ), investing, and working with youth. These efforts were funded by the Rose Foundation and Paul G. Allen Family Foundation. The BNCweb.org website is live and can be accessed by visiting www.BNCweb.org. 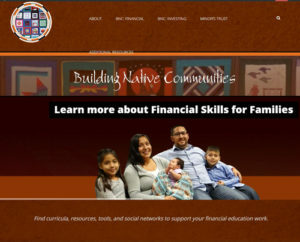 To download a free PDF copy of the new Building Native Communities: Financial Skills for Families participant workbook, visit the curriculum page on www.BNCweb.org, or the trainer’s tools page for the Instructor Guide. To pre-order copies of the workbook, contact Chris Hansen at chris@oweesta.org or (303) 774-8838. For more than 35 years, using a three-pronged strategy of educating grassroots practitioners, advocating for systemic change, and capitalizing Indian communities, First Nations has been working to restore Native American control and culturally-compatible stewardship of the assets they own – be they land, human potential, cultural heritage or natural resources – and to establish new assets for ensuring the long-term vitality of Native American communities. First Nations serves Native American communities throughout the United States. For more information, visit www.firstnations.org. First Nations Oweesta Corporation was created 15 years ago to address the lack of capital and financial infrastructure holding back economic development in Native communities recognized by its parent organization, First Nations Development Institute. First Nations Oweesta Corporation’s mission is to provide opportunities for Native people to develop financial assets and create wealth by assisting in the establishment of strong, permanent institutions and programs that contribute to economic independence and strengthened sover eignty for all Native communities. For more information, visit www.oweesta.org.